Tea Cake Kids. Clothing and accessories featuring children of color. Children love to play with balloons. 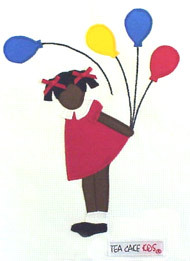 This t-shirt features a small girl carrying a bouquet of balloons. White t-shirt 50/50 Poly Cotton Blend with custom design appliqué of character.